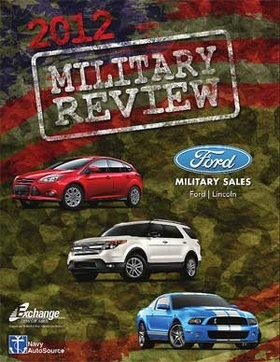 DETROIT -- As the nation prepares to observe Memorial Day on May 28, Ford Motor Co. and Chrysler Group are offering military personnel additional incentives when they buy new vehicles. The Ford Military Appreciation Sale, available to active duty personnel at dealerships in the Southeast and Midwest, offers $1,000 off any new Ford or Lincoln vehicle, free maintenance for two years and deferred payments for three months. The sale began Saturday and runs through May 28. The automaker usually offers military personnel a $500 discount, but Ford spokesman Robert Parker said the company decided to double its discount and include other incentives as a "good way to say thanks." Parker said the company will announce armed-forces incentives in other regions in the coming days. Similarly, active duty members, reserve personnel and veterans who buy or lease a new Chrysler, Jeep, Dodge, Ram or Fiat vehicle will receive a $1,000 discount on the vehicle through May 31. That is $500 more than Chrysler's typical discount for military members. General Motors is providing an "honor badge" to drivers who buy a Chevrolet vehicle through its military discount program GM said its discount program offers savings of $400 to $4,000, depending on the vehicle. The circular badge, available on request, features a yellow ribbon and is emblazoned with the phrase "Honor and Valor." Chevrolet also will donate $100 to Cell Phones for Soldiers for each vehicle sold through the honor badge program. Cell Phones for Soldiers provides troops serving overseas the ability to call their families in the United States for free.